Listen up, Meredith Grey has something to say. In early 2018, Deadline reported that Grey's Anatomy star Ellen Pompeo had extended her deal with Grey's for two more seasons (15 and 16), along with adding on an official producer title. The deal would total $20 million a year, with the star making upwards of $550,000 per episode, plus a signing bonus and two full back-end equity points on the show. This made her the highest paid dramatic actress on television. It was a big deal. TV stars' salaries and contract negotiations being reported on in detail by the trade magazine is really nothing new. The epic Modern Family cast contract discussions played out in headlines. Ditto The Big Bang Theory's cast's group effort to bump up their salaries. Even the Stranger Things' younger cast's raises were reported on. Usually, the stars themselves stay mum, choosing not to address the piggy bank in the room. Pompeo, however, took a different approach. A loud and proud one. In a cover story for The Hollywood Reporter, which labeled her "TV's $20 Million Dollar Woman," Pompeo, who turns 49 today, gave a shockingly open and honest interview about her fight to get what she deserved after starring on the ABC hit drama for 14 years. "I'm 48 now, so I've finally gotten to the place where I'm OK asking for what I deserve, which is something that comes only with age," she said, "Because I'm not the most 'relevant' actress out there. I know that's the industry perception because I've been this character for 14 years. But the truth is, anybody can be good on a show season one and two. Can you be good 14 years later? Now, that's a f--kin' skill." An agent reported to Pompeo that the show has generated almost $3 billion for Disney. Grey's was eventually sold into syndication to LifeTime for $1.2 million an episode and to Netflix for $1 million per episode. It is one of the longest running scripted series in television history. It airs in over 200 countries. It was ABC's second highest-rated drama in 2017. It ranked in the Top 10 across TV when Live+& day ratings were factored in. Reminder: It's been on the air for 15 years. Still, Pompeo admitted to initially feeling "greedy" asking for more money to keep doing Grey's...even though the show literally has hung on her word and voice since 2005. And even tried to justify it, rationalizingthat she was "periously close to broke" before auditioning for the role that would eventually change her life. "Now, maybe it's my Irish Catholic upbringing, but you never want to [be perceived as] too greedy. Or maybe it's just that as women, that's our problem; a guy wouldn't have any problem asking for $600,000 an episode," she said, "And as women, we're like, 'Oh, can I ask for that? Is that OK?'" In the interview, Pompeo credited the show's creator Shonda Rhimes, who had just signed her own whopping deal with Netflix, with giving her the "power" to speak up. "In Shonda finding her power and becoming more comfortable with her power, she has empowered me. And that took her a while to get to, too. It was part of her evolution. It's also why our relationship is so special. I was always loyal to her, and she responds well to loyalty," she said. "So, she got to a place where she was so empowered that she was generous with her power. Now, what did that look like? It looked like her letting me be the highest-paid woman on television, letting me be a producer on this show, letting me be a co-executive producer on the spinoff [Station 19] and signing off on the deal that the studio gave me, which is unprecedented." Pompeo also addressed they pay inequality between her and co-star Patrick Dempsey (aka the other half of the show's beloved couple), with the actor choosing to leave the show in 2015 becoming a "defining moment" for her when it came to her approach to her new deal. She revealed they used him as leverage against her for years and that the two of them never discussed their contracts, not that she didn't want to band together like many co-stars before them. "There were many times where I reached out about joining together to negotiate, but he was never interested in that," she shared. "At one point, I asked for $5,000 more than him just on principle, because the show is Grey's Anatomy and I'm Meredith Grey. They wouldn't give it to me." She continued, "I could have walked away, so why didn't I? It's my show; I'm the number one. I'm sure I felt what a lot of these other actresses feel: Why should I walk away from a great part because of a guy? You feel conflicted but then you figure, 'I'm not going to let a guy drive me out of my own house.'" And in an interview with InStyle, she revealed she's been fighting this fight far longer than most people realized, saying, "I've been fighting since the very beginning. When I started this show, I didn't know that on a SAG contract you're not able to renegotiate until Season 3. So it wasn't until Season 3 that I found out I was actually being paid less than Patrick Dempsey." Then McDreamy died (Spoiler alert!). Fictional true love was dead. Fans cried. Viewers vowed to never watch again. Except they did come back, with others joining them. "So, what does it look like when he leaves the show? First, it looks like a ratings spike, and I had a nice chuckle about that," said Pompeo. What she wasn't chuckling over a few months after her industry-shaking profile in The Hollywood Reporter was her candor about her deal and contract being used against her after it was announced that Jessica Capshaw and Sarah Drew would be exiting the show at the end of last season. Pompeo's massive two-year deal was referenced in many articles, including Deadline (which Pompeo also did an honest interview with), leading many fans to blame their star's contract for the losses of Capshaw and Drew. With a pair of tweets, Pompeo addressed the unfounded speculation and took the media outlet to task. "Its unfortunate that @DEADLINE chooses to try to pit women against eachother on #InternationalWomensDay #shameonyounotme," she wrote. "I'm a big girl @DEADLINE can take shots at me if they want but to the fans please don't fall into that trap. This is above my pay grade." Showrunner Krista Vernoff also issued a statement addressing the rumors and defending Pompeo. 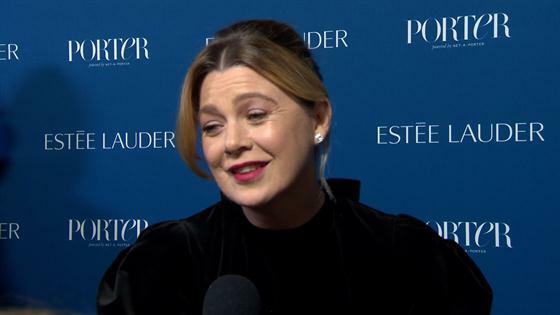 "Regarding #GreysAnatomy and @EllenPompeo," she wrote, before attaching an image with a lengthier statement. It reads: "The suggestion in the Deadline article that our cast changes are in any way related to Ellen Pompeo's salary renegotiation is wrong and hurtful and misguided. It smacks of an old, broken, patriarchal notion that women must be pitted against each other and that one woman's success will be costly to others. Ellen Pompeo has not only advocated passionately for her fellow cast members, she has taken the time to educate women world wide as to how to advocate for themselves and that must not now be twisted. In an interview with Entertainment Weekly in September, Pompeo addressed the range of responses she's received from women since going public with her deal. "It's been a very interesting ride, the whole topic of standing up for yourself and what it takes to get yourself emotionally to the place where you're comfortable doing that." While some women approached her crying on the street, others, you know, used her as the the "greedy" reason for her two female co-stars departures. "It's still more challenging to get women to support you when you're actually on top and doing fantastic," she acknowledged. Pompeo added, "I'm glad I did and I'm really glad that it was received in the way that it was received, but we still have a really long way to go with respect to women supporting women." Now, with her interests reaching far beyond acting, including directing, producing and developing her own projects with her production company, along with spending time with her husband Chris Ivery, 51, and their children, daughters Stella, 9, and Sienna, 4, and 21-month-old son Eli, Pompeo is also being open about her future on Grey's after her deal expires. "I'm clearly not prepared right now to make any kind of formal announcement about what my future is on the show, but I am really feeling like we have told the majority of the stories we can tell," Pompeo said. "It's about time that I mix it up. I'm definitely looking for a change." She later clarified to E! News, "I take it day by day and season by season." Just know that once Meredith Grey walks out of those hospital doors, Grey Sloan Memorial Hospital will close for business as Rhimes has made it very clear that there is no show without Pompeo. "Ellen and I have a pact that I'm going to do the show as long as she's going to do the show," Rhimes said. "So, the show will exist as long as both of us want to do it. If she wants to stop, we're stopping. So, I don't know if we'll see 600, but I want to keep it feeling fresh. As long as there are fresh stories to tell and as long as we're both excited about the stories being told, we're in. So, we'll see where that takes us." Something tells us Pompeo will be the first to let us know. When asked by InStyle which character trait she has that she will never apologize for?